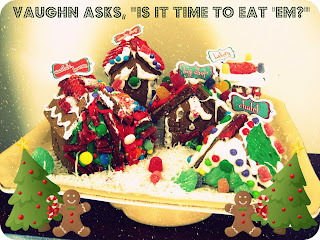 Vaughn was confused when I explained to her that we don't eat the gingerbread houses. I mean, I guess you could eat some, but these prepackaged ones are a little suspect. And the fact that I used hot glue to assemble each house makes it a little less appealing too. I've made a homemade gingerbread house years ago and I promised myself to never do it again. The dough was so massive that it fought the stand mixer and it took me two days to get everything measured out and baked. Even that one didn't get eaten. We've been inside pretty much for 2 days. The kids are nuts and I have to find somewhere to take them today to run off some energy. I'm dreading that I'll be in a bounce house warehouse in a few hours. Yikes.